The blossoms are opening up and so are we as we’re getting outside more, taking in the color and smells of spring! We’re working out the kinks as we get wake up and move our hibernating winter bodies. I invite you to take advantage of my spring coupon. No need to print it out. Just mention it to me upon payment. Happy Spring everyone! After moving my studio up back up to my home, I’ve been diving deep into healing touch. In my home studio under the wise conifers I don’t have the noise distractions that I did in my downtown space and the quiet has been taking me deeper into my work. I’ve been reflecting on how, in one session, I’m able to hold my attention in many different ways and sometimes it feels like I’m shape shifting. 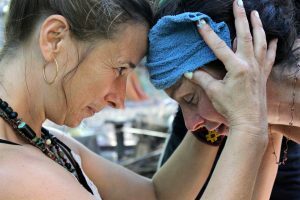 I felt inspired to write about it and I’m sure there are therapists out there that will relate to the expansive presence that healing touch can invoke. If you are a practitioner, please feel welcome to share some of your own experiences. In a single session, recipients of healing touch are slowly transitioned from a state of tension or overwhelm from all of the stimuli coming at them daily into a more relaxed and open state. Massage or healing touch helps integrate the external and internal realities and the physical and emotional body. Through this process, they may experience WOW moment(s). If you’re a recipient of healing touch please feel free to share stories of any Aha moments you’ve had in a session. 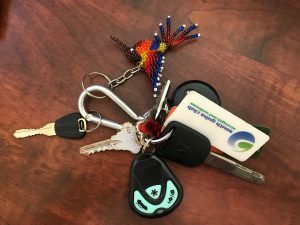 I’m honored to hold this space and I wanted to share a little about what the experience is like on my end. I’m honestly not sure that shape-shift is the right way to put it exactly but I’m using the word ‘Shape’ to describe the different facets of myself that can come through during a session. I stay open in a way that invites each of these shapes to become and it’s in the becoming that I feel whole. I’ve somehow managed to put into words some of what makes up the whole of me as a practitioner. I hope you enjoy and I’m eager to hear your own experiences as a giver or receiver of healing touch. There’s the obvious bodyworker part of me that’s been trained and that loves anatomy. 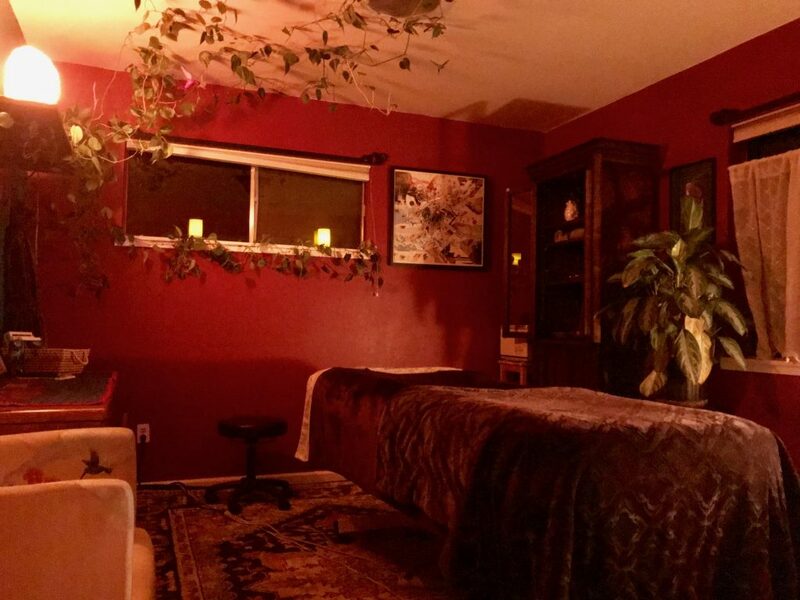 I will step up a massage session, offering active pin and stretch methods, traction and compression, ventral and abdominal unwinding, acupressure, etc. The practical tools that I’ve gathered over the years helps the recipient release postural restrictions that cause tension, open their range of motion and as a result the muscles that have been overworking get to take a break and often this relieves symptoms of pain or tension. This is the part of me that opens to see the web of life in my client. I open my perspective to see beyond the point(s) of pain to the web of life within which the pain is wrapped. This helps me navigate where and how to make more space for my client to move freely. There’s the healer who understands that human touch and nurturing can be a reminder (for those of us who spend most of our time in our heads) where exactly our toes are. I incorporate long delicious effleurage strokes with a healing oil from the feet to the head and back down again. This anointing reminds us that receiving touch is about coming home to ourselves from head to toe. There’s the healer who is also healing herself. Healing her body, her heart, her mind. The one who knows what it’s like to live in a body that has it’s own challenges. Because I know physical pain, heartbreak and grief, I know how to listen and stay in rapport, not offer Pollyanna solutions but stay present. Before a session, I sit quietly and acknowledge the places in my body and spirit where my own healing is happening. This brings me into a grounded, honest rapport with myself so I can be more present with my client and it builds an energetic foundation of trust. Rapport and trust are the first steps to an effective healing session. When intuition guides me, I might conjure healing in unconventional ways. I might place the Tibetan bowls on my clients body and play them. I know what to do and trust my gut. I respond when I’m guided to place a specific stone in a clients hand who needs it or when to bring out my fan to cleanse the body with sage and when to place a drop of ceremonial water on their forehead. Intuitive healing is a celebration of the present moment because it’s not planned. Those spontaneous moments have a special life force to them. That aliveness shifts stagnant energy. Sometimes my client has a lot they are working on and it isn’t just physical. Because I was a student of NLP and have tools to draw on, I might help navigate an unwinding of emotions or behavioral patterns trapped in the body. We might find out who was the youngest version of themselves that felt the emotion. We might take the emotion out of the body and dialogue with it, see its shape, ask its name, find out what it wants. This somatic healing process, coming from a non threatening presence allows the emotion to take on new resources and let go of ways that feel stuck or no longer serving. There is the spiritual warrior that refuses to be limited by the human body. The one that sees/feels that I’m part of an ALL that is immeasurable which makes me a spiritual being, walking the earth through life in a human body. I like quantum physics theories, even if its all just hearsay and ever changing. I believe that for every finite form there is an infinite amount of spaciousness within. I might offer a guided meditation so my client can tap into this sensation of spaciousness within the body where the closed eyelids that normally shut the world out become windows gazing into the infinite spaciousness within. Moments like this can release the self imposed shackles that the mind constructs within what appears to be confines of the human body. In a meditative state of mind where spaciousness and freedom become the reality, physical freedom follows. There is the part of me that knows that my client is ultimately their best healer and I am merely a conduit for the healing. This one gets invisible, steps aside, quiets down and allows. Holding the cranium, I ‘suspend’ my client in the ‘field’ while emptying my mind and arriving to the oneness of ALL (some might name it God or Holy Spirit, Great Spirit, etc.) The field is pure spaciousness where there are no obstacles. It’s where the deepest listening occurs and when I’m here in this field, I find it a most potent time to put out an invitation or prayer for healing. A few shapes to the whole of me. In terms of bodywork and massage, what happens after the baby is born? Every birth is so different but generally what I’ve experienced is that after birth there’s a time that my client will be retreating, adapting to their new life and bonding with their baby. If I wasn’t present at the birth then I make no assumption about what’s taken place. Rather than sending congratulations, I’ll send a message expressing curiosity in how my client is doing. This avoids any assumption that everything is well when there’s a possibility that there may have been complications. This way I’m sure to stay in rapport. I’ll let them know that I’m here for them when they need me for postpartum bodywork or a relaxing massage. Once your client is ready to receive a massage they’ll invite you to a house call or will come into the office. If you don’t hear from them regarding postpartum massage, an email to them that educates on the benefits of postpartum massage with a coupon attached may be just what they need to ignite their attention towards self care once again. How soon can I massage my client after birth? As soon as your client is comfortable to receive it and there are no known complications. Post Cesarean: Any abdominal massage or any core recruitment requires a wait until about 6-8 weeks when scar is healed and scar tissue is formed. Why is postpartum bodywork necessary? I can’t stress enough the importance of postpartum bodywork. Blending postural opening and balancing with relaxation massage is the key. The emotional load of new parenting, the lack of sleep, and the physical recovery as the body’s displaced muscles, organs and bones find their way back into place all will benefit from the integrating postpartum session. 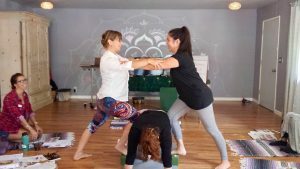 How can I help my client’s improve their posture? The positions and activities of early parenting can be compromising to the body most of the day, every day creating repetitive holding patterns in the anterior (front) fascia. Looking down is one of the many gestures responsible for this. 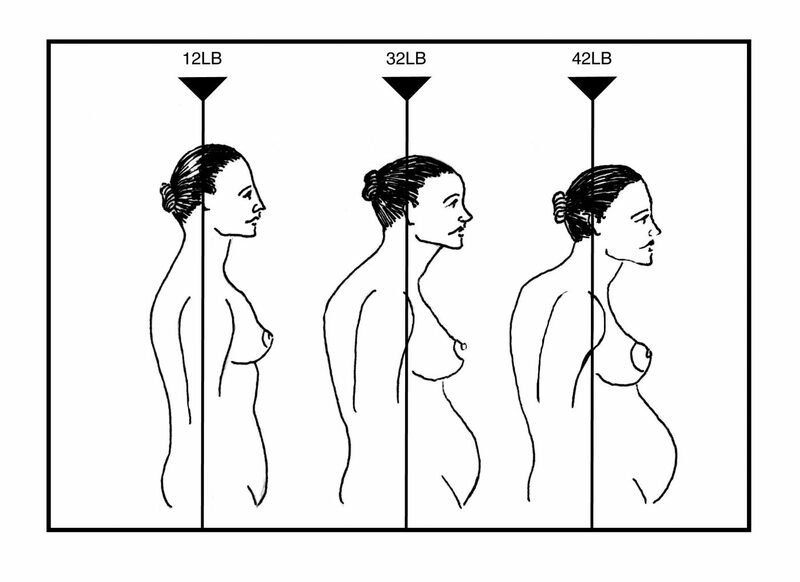 Forward head posture (FHP) is what causes neck and shoulder tension in new parents. Imagine the number of diaper changes, the amount of nursing hours, not to mention the hours gazing down in awe at this beautiful new arrival. And then there’s the weight of the breasts pulling the thoracic spine forward. The tension in the back of the neck and shoulders usually is coming from the constricted fascia in the front. 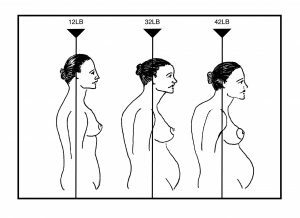 According to Kapandji (Physiology of the Joints, Volume III), for every inch the head moves forwards, it gains 10 pounds in PSI weight. A normal 12 pound head can turn into a 32 pound head respectively. This gets translated to the muscles in the upper back and neck and they have to work much harder to keep the head (chin) from dropping onto the chest. FHP also forces the suboccipital muscles (they raise the chin) to remain in constant contraction, putting pressure on the 3 Suboccipital nerves. This is why ventral and abdominal anterior unwinding is needed in massage for any new parent to help support good posture and to release neck and shoulder tension. What should I expect during a postpartum session? The client finally gets to lie on their belly and back or any position during their postpartum session. Their breasts may be sore and full of milk. A memory foam topper is helpful. Breasts may leak breast milk during the session so provide a towel for your client to place under or over breasts whether lying prone or supine. The hormone oxytocin causes the milk ejection reflex (MER) or letdown. If my client’s baby wants to nurse during the session, how do I accommodate a nursing baby? I always let them know that their baby is welcome to the session. Your client will appreciate this gesture of support. Ask them to bring someone to care for the baby if possible and inform them that if baby needs to nurse during the session it wont pose a problem because you can always switch to side-lying and still get a lot of bodywork done while their baby is nursing. Knowing this, you may want to save low back and hips for the last part of the massage just in case you find yourself working on a side-lying, nursing client. There is also the possibility that your client may not be ready to be separated from their baby at all and so you may have a fun and adventurous massage with a baby present. Think about adding a memory foam topper to your massage table for your clients comfort in side -lying positioning. What positions are OK for postpartum massage? All positions are safe unless compromised circulation is present in which case you would use left side-lying. Side-lying if breasts are sore (usually first few weeks) or if client needs to breast feed while in session. Are there postpartum massage contraindications? There are many warnings and contraindications and it’s important that you are certified in pregnancy massage or have learned those before proceeding with massage. What if my client had a C-section? The importance of gentle and soft abdominal massage is crucial after a C section to help break up scar tissue. The surgeon’s cut may have been precise but scar tissue forms differently for everyone, sometimes irregularly and may even form adhesion over internal organs. Gentle massage will help break up those scar patterns so the client does not have unwanted back or pelvic pain. Adhesion can also prevent further pregnancies which is another reason to be sure to offer abdominal massage. There are time guidelines and contraindications for post C section massage that a massage therapist would learn in a certification course. Is it OK to let my client talk during a session? Emotional unwinding Your client has just gone through one of the biggest passages of their lives and will probably want to share with you their birth experience as you work. Allow for this unwinding with a listening ear. Eventually she will drop in to receiving and telling her story will help the process of letting go into the present moment. The more present they can be with themselves, the more present they can be for their baby. What mechanical advice can I give my client? Watch your posture, try not give yourself away. When picking up child try not to bend over. Instead, squat to pick up child, try a kegel and push feet into the floor to stand while engaging glutes. Counter stretch whenever possible especially after long held positions like nursing. Try not to favor one side. Try slightly tucking chin to help improve suboccipital tension. Alternate sides when holding child. Stay hydrated, set a timer on phone for water intake. Yoga, pilates, or joining a postpartum exercise class can help recruit the core when the client ready for that. It’s good to encourage them but your client may not be ready, so be sensitive to their process and stay in rapport. Feb. 15, 16, 17, 23, 24. Pre-registration discounts will expire after Jan 1, 2019. Class is limited in size and registration closes after 12 students are enrolled. I have had several clients come to me with a sharp pain in the pad of their foot (or both feet) which has been diagnosed as plantar fasciitis . The pain is so bad that there are days when they can hardly walk or they have pain in bed which impacts their sleep. Many doctors will prescribe cortisteroids and other injections as well as provide orthopedic inserts for shoes. Why don’t we address the common structural problems that lead to plantar fasciitis, so we can avoid all of that? The key to solving the plantar fasciitis dilemma is structural and Dynamic Fascial Response™ is an effective path to healing it. Finding a therapist who has some form of fascial bodywork training or self study along with knowledge in postural alignment exercises is essential for quick recovery of plantar fasciitis. Fascia is an uninterrupted, three-dimensional web of tissue that extends from head to toe, from front to back, from interior to exterior. It is responsible for maintaining structural integrity; for providing support and protection; and acts as a shock absorber. Therefore, when addressing this condition of plantar fasciitis, DFR™ doesn’t go straight to the pain spot and start working it. We assess the body and emotional body with a broad vision so as to approach plantar fasciitis with the integrity and ‘deep listening’ that it deserves. There are some key muscles that play a part and they are namely in the legs. Addressing these lower posterior muscles and the posterior fascial chain that connects them to the calcaneous via achilles tendon, a therapist can relieve plantar fasciitis in a few one hour sessions. Even one 90 min. session will cure the pain of plantar fasciitis but I would suggest two or three follow up sessions to continue to iron out any fascial restrictions whether or not posture, weight, lifestyle or compromised muscle recruitment presents the potential ‘bounce back’. Plantar fasciitis treatment can also be performed on prenatal clients in a side-lying position while taking great care to avoid contraindicated points and positions for special populations and conditions. Our next Pregnancy Massage Certification is coming up and here are what professional bodyworkers are saying about this dynamic, continued education training…. See dates and sign up for the next training by clicking this link. “Chula was such a helpful calming soothing presence during my pregnancy and at my birth! 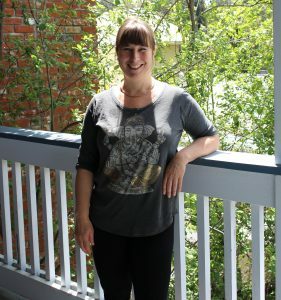 She worked with me prior to my birth multiple times, and her strong, skilled work helped my back stay out of pain, and my body adapt in a healthy way to the changes it was going through. At my birth, Chula’s talented touch and grounded nature helped me make it through the worst contractions and gave me rest and rejuvenation in between contractions. Her years of experience as a peri-natal therapist built trust, and her warmth and nurturing presence was a balm while I labored. She knew just where to apply pressure and how to work on my body to give the most support. Chula’s strength and stamina was amazing! In spite of a very long labor, Chula stayed by my side for several hours and continuously gave sustained deep work that made my experience easier. Chula’s presence provided more than massage therapy – she was counselor, unofficial doula, and even stayed after everyone else left to do the laundry and clean the house! As the days get longer and I find myself out and about more and more, I feel my body unwind and open from the inward wintertime activities of writing, reading books, crafting, and lot’s of movie watching. Just as the blossoms and leaves of early spring begin to unfurl now, I am inspired to speak to the ways in which we are able to unfurl and open our posture through a method I call Dynamic Fascial Response™. I hope the self massage technique that I teach you here helps you to feel rejuvenated as you blossom open into spring. How do our bodies get stuck in postural patterns? To understand postural patterns we first need to look at one of the most important organs, the body’s fascia. Fascinating Fascia (Pronounced Fa (A as in apple)-shah). Fascia is completely amazing and here is a brief description for the purpose of a more leisurely read. Your body’s fascia is one continuous structure that is web-like and although there is fascia found in between and around the cellular structures (e.g., muscles, organs, bones) it’s been discovered that it also interpenetrates the muscles, organs and bones spanning, without interruption, from head to toe. So far so amazing right? Even more fascinating is that the fascia has no fixed pattern or movement the way a web does. When a spider web expands by the force of the wind, it’s geometry simply stretches wider then returns back to its’ original form. The most impressive thing about the fascia is it’s morphing ability. This magical web of fibrous material, is hollow and filled with hydration and is ever-changing in movement. One fibrous web segment of your fascia can morph into two segments during movement! Yes, the fascial fibers have the ability to morph, sliding in and out of themselves as our body moves (see photo on below by Dr. Jean Gimbertaeu of one fiber morphing into two). Fascia, one fiber morphing into two. Photo clip from Jean Gimberteau’s impressive film ‘Strolling Under the Skin’. Through its’ amazing tensegrity, fascia is able to bounce back to to it original structure after intricate orchestration of each of its complex movements. This happens even in involuntary movements like gastric motility. Fascia, has a fractal, icosahedronal architecture (see image to left) and it is the infrastructure of our standing posture and how we move throughout this world. Without it you would be merely a pile of muscle and bones. Did you know you are a fractal icosahedron? Wow! A must see film of fascia can be found on youtube. I highly recommend Jean Gimberteau’s impressive film ‘Strolling Under the Skin to all bodyworkers and anatomy enthusiasts! You can click here to watch this film. Movement Matters: Fascial range of motion becomes most compromised when movements become limited. A great read on movement is Katy Bowman’s, Movement Matters. 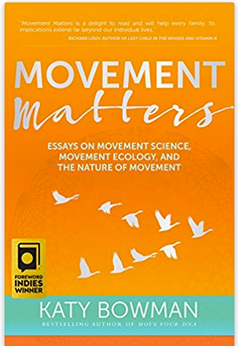 It is full of great essays discussing the many ways our natural movements have become so limited through technological advancements and cultural changes. The book inspires the reader to move as much as possible in as many ways as possible. It’s so well written, with a sense of humor and also with a revolutionary tone of taking back our birthright to move. The key faub for instance limits the hand, wrist and arm movements formally used when turning a key. Signs in parks warning us Dangerous – Do Not Climb Tree. Teaches that it is dangerous to climb a tree. 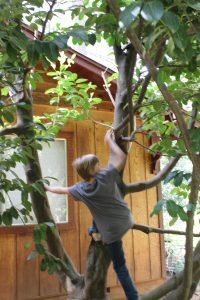 Climbing trees is actually a great way to move our bodies and it explores a wide variety of range of motion movements from head to toe. So next time someone tells you to go climb a tree, you might want to take them up on it! Movement Matters by Katy Bowman. According to Kapandji (Physiology of the Joints, Volume III), for every inch your head moves forwards, it gains 10 pounds in PSI weight. As it moves forward, the muscles in your upper back and neck have to work that much harder to keep the head (chin) from dropping onto your chest. This results in neck and shoulder tension caused by restrictions in the anterior (front of body) fascia. One of the most constant factors that I see in my clients with shoulder, neck, and other structural holding patterns that cause tension and pain, is forward head posture. Generally speaking, forward head posture can be the result of several factors. This pattern can be caused by excessive driving, anterior weight gain of pregnancy, nursing, tending over small children, doing craftwork, art, music making, writing, massaging over a table all day, etc. One of the most common is a flexion lifestyle of sitting all day in front of a desk computer. Anyone who does anterior dominant activities on a daily basis is susceptible to this postural pattern if they don’t counter stretch and do some type of strength training (this might include yoga and pilates as well as weight or resistance training). Strengthening the muscles of the traps and rhomboids can help counter balance the forward pull. Pregnancy and new moms – All wrapped up. Some lack of movement however is created by life itself. A new mom for instance may nurse her baby, looking down at it, completely in love. She will hold her baby everyday, pick up her baby, she may change baby’s diaper on a low bed rather than a high changing table. So in the case of this new-mom example, the constant looking down, forward dominating movements and lack of full range of motion along with the physiological changes of increased breast size may cause the fascia to start to bind and wrap, in relation to the motion of the body’s muscle movements, or lack of. I call these areas wrapped points. The body pain and tension this postpartum mom is feeling may be felt in her occiput, neck and shoulders. The holding pattern caused by the wrapped points most likely originates in the muscles of her chest and front of the neck. My approach as a bodyworker is not to go straight to the areas of discomfort but rather go to the wrapped points to begin the unwinding. The method of my bodywork that I call Dynamic Fascial Response™ has changed how I work on bodies, how I assess them and also how I care for my own. It begins with something that I call anterior unwinding. It has been my signature style for years because it creates lasting results. Now I am teaching it to other practitioners so they can offer this work to their clients. It is advanced bodywork that has helped improve my clients’ posture as well as reduced if not eliminated pain completely, often in just one session. Anytime one does anterior unwinding on a client it is important to be trained it it first so you can take necessary precautions and understand the quality of touch needed for fascial work. There is however a simple and safe self massage you can do on yourself. Getting the fascia to unwind works best with no oil but if your skin is sensitive try placing a small amount of oil or lotion on your hands and rub into hands rather then on the chest before stretching. This way it is not too slippery. If your body or hands are too slippery fascial unwinding is harder to achieve. *The first time you perform this fascial unwinding it may feel intense but take it easy and always slow, never experiencing pain but rather meeting the limit of a comfortable range of motion just were you are at on each day and not stretching past it. Be sure to move very slowly and inhale your chest up into your hands as you move pause to exhale and when you move again inhale up. 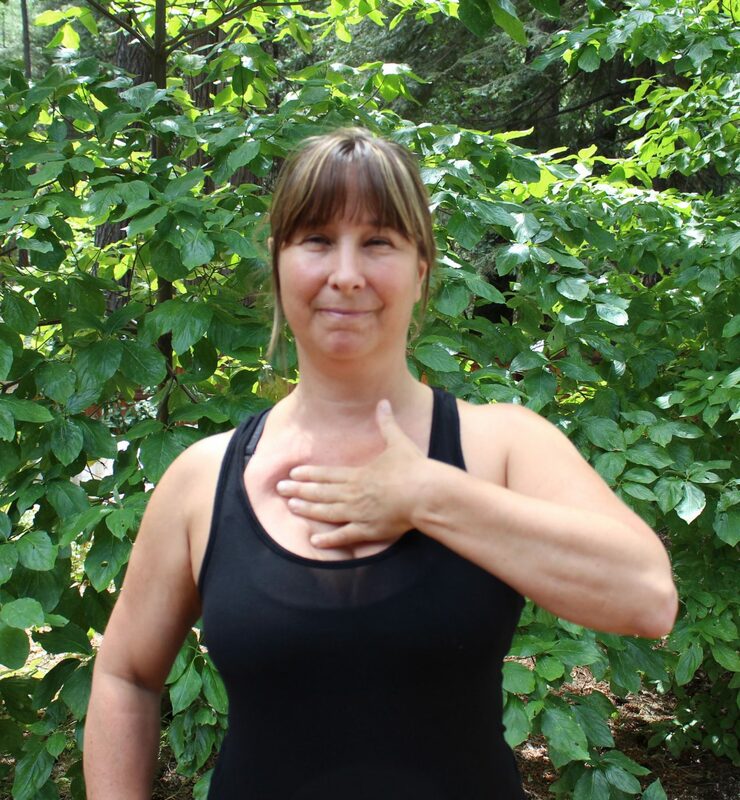 This chest breathing is quite different then the belly breathing many people are used to but it will activate the thoracic body and bring chi to that area as well as create a resistance stretch as you perform the various strokes shown below. Once you complete this unwinding of course feel free to apply oil. It will feel nourishing and delicious. As you perform this fascial release daily you will feel a significant opening along with a release of the neck and shoulder tension you were feeling in the back of your neck. 1) Begin chin to chest and start by placing your finger pads just under your collarbones and on either side of the sternum. Drag finger pads down the chest while you counter stretch very slowly by tilting your chin upward. Open and close the jaw slowly. 2) Continue in this pin and stretch fashion by placing finger pads of left hands to the right of the sternum and under right collar bone and chin down towards hands. Explore range of motion slowly by tilting chin up and tilting your left ear towards your left shoulder while dragging finger pads slowly down towards right axilla (armpit). Repeat on left side. 3) Place finger pads of left hand to the right of sternum, under collarbone. Drag towards right shoulder while turning head to the left. Repeat on left side. “I was fortunate enough to find Chula as my prenatal massage therapist. I am also a bodyworker, and so appreciate a knowledgeable, effective bodyworker. Chula is not only both of those, but also very professional. Chula worked on me at the end of my first pregnancy, and so when i was pregnant again this last year, I couldn’t wait to call her again. I can’t begin to express the amount of gratitude I have for her! She helped me so much with extreme pains I experienced during my pregnancy. Her understanding of the body and her ability to apply that knowledge make her a wonderful therapist. If you are interested in taking one of my classes, you can view the 2018 schedule by clicking here and email me to register. The contents of this article are not a replacement for medical care. When it comes to pregnancy, why is it so hard to find a good massage? Your regular therapist used to get to it and knew just what you love. Suddenly they touch you with a sense of uncertainty and give you a light massage. Perhaps it is because they forgot that brief segment taught in massage school on prenatal and are concerned they might do the wrong thing or maybe it is because the prenatal client is so often and wrongly deemed “fragile” and therefore given a light, superficial massage. You are a human about to birth a baby and though you may have some aches and pains and may be experiencing hormonal mood shifts, I would hardly call you fragile. If you are pregnant you will know what I am speaking about when I say: You are dynamic! Most likely you’re wanting a bodywork session that will help integrate the plethora of structural changes you have experienced to date and one that will leave you feeling physically relieved and emotionally relaxed. And why seek a prenatal specialist? Most people know that pregnancies sometimes do have complications. A pregnancy massage specialist has been trained in pregnancy complications and conditions and will not only have the knowledge to support you safely in your prenatal journey, while still giving you a session that makes you feel the relief you were hoping for, they also may hear signs of a condition and guide you to consult your care provider. If you request, the prenatal specialist bodyworker might attend your birth and also serve in a supporting role postpartum. A prenatal massage specialist has a foundational understanding of correct positioning and they will never put you in a cut out table or scooped out cushions only to further stretch your uterine ligaments that may already be strained or put extra weight on your baby. A continued education training in prenatal teaches the full array of contraindicated modalities and points on your pregnant body that were never taught in the 500 plus hours of massage school. A prenatal specialist already has experience with a larger population of pregnant clients and is well aware of the emotional stages you might be experiencing throughout pregnancy. They have deep listening experience and may have even been trained on how to support you. Maintaining regular prenatal care will help the circulation remain healthy throughout pregnancy. Promotes relaxation, lowers cortisol, stress and anxiety and promotes a good sleep. Promotes a healthy inner environment for the client to grow a baby in. Promotes body awareness, mobility, flexibility and preparedness to birth the baby. Offers the client a listening ear to voice any concerns or emotions. Addresses and treats deeper physiological responses to the stages pregnancy (Digestion, breathing, high blood pressure, blood and lymph circulation). Prepares the client’s somatic syncing of body and mind for an easier birth. Addresses and solves bodily pain and tension. Reduces ligament strain. Opens the thoracic lumber and ribs, allowing for deeper and easier breathing. Helps musculoskeletal structural alignment and integration throughout pregnancy, during birth and postpartum. Prenatal and Postpartum massage grows a peaceful, touch-based core understanding of connection that can travel from massage therapist to client/mom and then from client/mom to baby. Reduces back pain, sciatica, ribs out, neck, shoulder and jaw tension. Reduces ligament strain, and body pain. Gives the birthing client and team specialized support. Prepares the mothers’ body for an easier, quicker birth. Opens pelvic floor, takes pressure off sacrum and sacral ligaments. Can help induce a late term pregnancy. Promotes relaxation and lowers cortisol. Reduces back pain, sciatica, ribs out, neck and shoulder pain from nursing. Postpartum massage helps with milk production. Releases muscle strain due to labor and delivery. Balances hormones which can help decrease the onset of postpartum depression. Helps the postpartum client heal from birthing the baby through natural childbirth or cesarean. Offers the mother a listening ear so she can decompress and voice any concerns or emotions and share her birth experience. 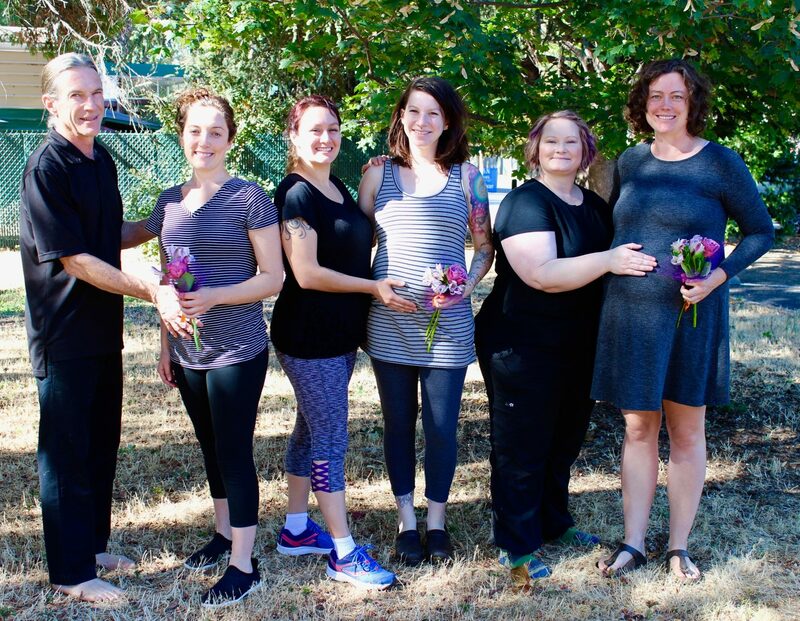 Prenatal and postpartum massage grows a peaceful, core understanding of connection that can travel from massage therapist to mom and then from mom to baby and also to partner/family. As an instructor and pregnancy massage specialist, I empower practitioners with a training so complete that they can offer a fantastic session, steeped in confidence and care. Hope you are staying warm and cozy! or friends a healing massage, classes or somatic healing sessions. I look forward to it! No need to print coupons, just mention them to me when purchasing. Take $20 off your gift certificates this year! 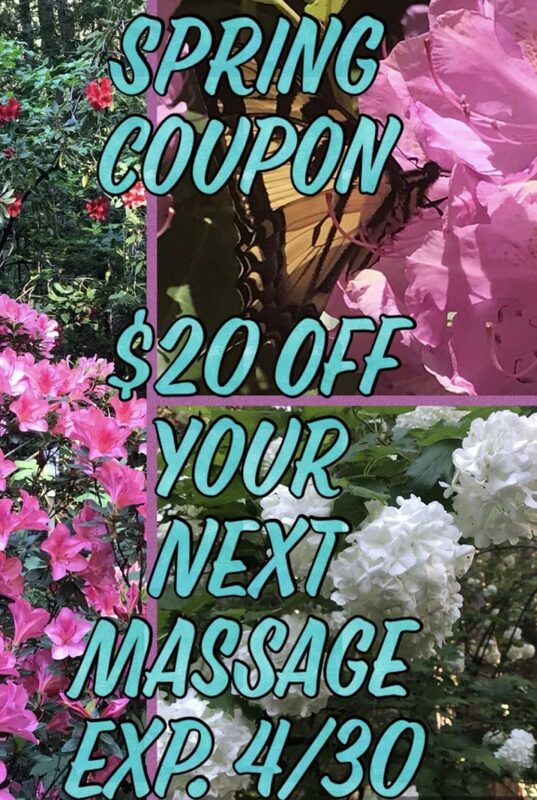 Take $20 Off Any Massage Training Course When Paid in Full. Education is a wonderful gift to give. So many of us want to learn new skills but affording it can be a challenge. 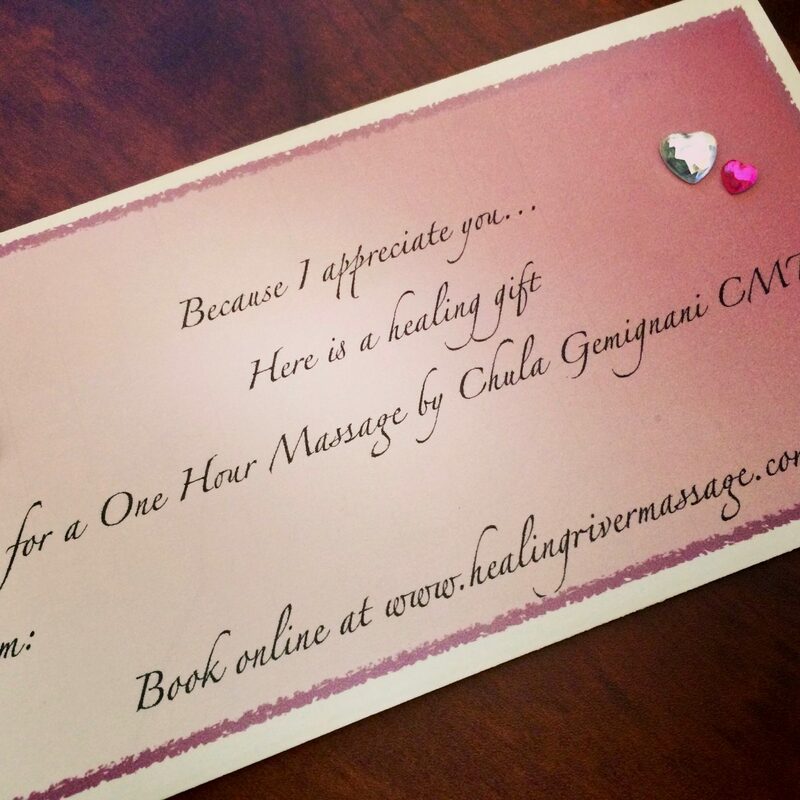 Gift a massage course to any bodyworker, doula or RN you know. These classes are approved by the National Therapeutic Board for Massage and Bodywork for continued education units. Prepay before 12/31/17 for any class and get the earlybird discount PLUS $20 off! Coupon: 4 Sessions/$450 when paid in full.